In Hawaii, Aloha Friday is the day that we take it easy and look forward to the weekend. So Kailani thought that on Fridays she would take it easy on posting, too. I like the idea, therefore, I’ll ask a simple question for you to answer. Nothing that requires a lengthy response. Do you ever take your wedding off? I guess this question kind of excludes some people so if you aren’t married what do you think you would do? Me; I almost never wear mine. That’s because I only wear it when I leave the house. I don’t like to wear it at home because I have to take it off to wash my hands anyway (which I am doing every time I turn around). Also I don’t want to scratch Lily with it. I love my ring, my Hubby did a great job picking it out. I wish I could wear it more often but its not practical. 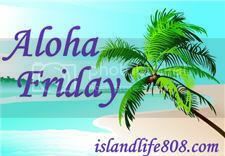 This entry was posted in Aloha Friday, Fun and tagged Aloha Friday.